400 Kilometres is a full-length comedy by Drew Hayden Taylor. With his usual flair for mixing comedy and drama, Drew Hayden Taylor tells the story of Janice Wirth, a thirty-something urban professional. Having discovered her roots as the Ojibway orphan Grace Wabung, Janice discovers she is pregnant, and must now come to grips with the question of her 'true' identity. 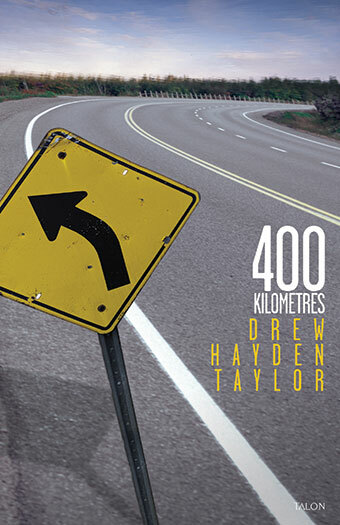 400 Kilometres is the third play in Drew Hayden Taylor's hilarious and heart-wrenching identity-politics trilogy. Janice Wirth, a thirty-something urban professional, having discovered her roots as the Ojibway orphan Grace Wabung in Someday, and having visited her birth family on the Otter Lake Reserve in Only Drunks and Children Tell the Truth, is pregnant, and must now come to grips with the question of her "true identity." Her adoptive parents have just retired, and are about to sell their house to embark on a quest for their own identity by "returning" to England. Meanwhile, the Native father of her child-to-be is attempting to convince Janice/Grace that their new generation's future lies with their "own people" at Otter Lake. Which path for the future is Janice/Grace to choose, for herself, her families and her child, having spent a lifetime caught between the questions of "what I am" and "who I am"? 400 Kilometres premiered in 1999 by Two Planks and a Passion Theatre in Wolfville, Nova Scotia as part of the Atlantic Theatre Festival. Since then the play has been successfully staged at several professional theatres across Canada and in the US. Drew Hayden Taylor one of Canada's best known and most prolific Indigenous writers. An Ojibway born on Curve Lake First Nation near Peterborough, Ontario, he has worn many hats in his literary career, from performing stand-up comedy at the Kennedy Center in Washington D.C., to being Artistic Director of Canada's premiere Aboriginal theatre company, Native Earth Performing Arts. He has been an award-winning playwright (with productions of his work in Canada, the US, and Europe), a journalist/columnist (appearing regularly in several Canadian newspapers and magazines), short-story writer, novelist, television scriptwriter, and documentary filmmaker.